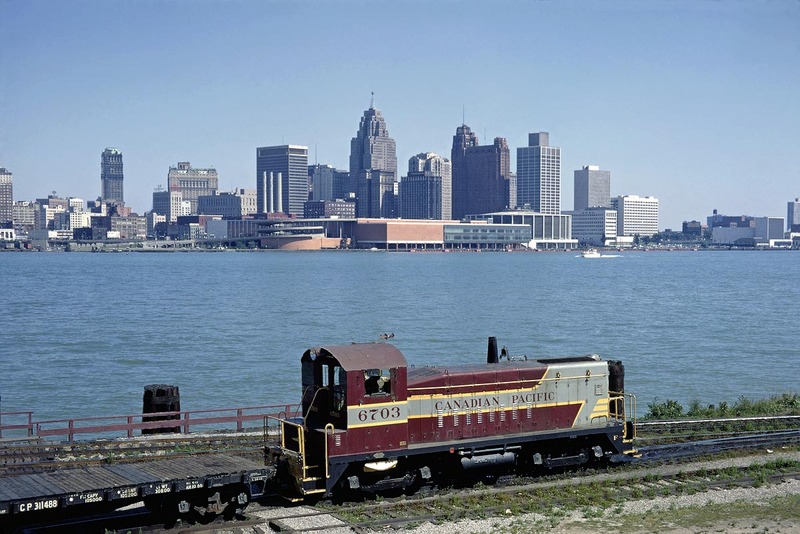 Railpictures.ca - Dave Beach Photo: I submitted a picture last night of CP SW8 #6703 in the Multimark “Pac-man” paint scheme switching the ferry slip in Windsor in March 1978. I’ve probably been to Windsor 3 times to take train pictures over 50 years and on 2 of those that were 11 years apart I found the same SW8 at the ferry slip. Here in June 1967, it’s in the maroon and gray but still providing the same service. That makes me wonder if this was just railroad habit, a rare coincidence, or if there was some special modification done on it. | Railpictures.ca – Canadian Railway Photography – photographie ferroviaire Canadienne. Caption: I submitted a picture last night of CP SW8 #6703 in the Multimark "Pac-man" paint scheme switching the ferry slip in Windsor in March 1978. I've probably been to Windsor 3 times to take train pictures over 50 years and on 2 of those that were 11 years apart I found the same SW8 at the ferry slip. Here in June 1967, it's in the maroon and gray but still providing the same service. That makes me wonder if this was just railroad habit, a rare coincidence, or if there was some special modification done on it. The early 6700′s (6700-6709) spent most of their time assigned to switching assignments in southern Ontario, namely Windsor, London and Oshawa. A few have mentioned that in the 50′s/60′s CP wanted to keep some GMD switchers around amid all their ALCO/MLW S2/S3′s for switching GM plants (namely Oshawa). Another fine look back at the past. The Detroit skyline looks a bit bare without the Rencen, Joe Louis Arena and a number of other tall buildings in the downtown area. I don’t know about other jurisdictions on the CP but switchers in Windsor such as the 6703, 7023 and 8163 were here from their days in the maroon scheme right on through 1 or 2 phases of the CP Rail schemes. Thanks for sharing these fine images from bygone days in Windsor. Awesome Dave Definitely a time machine worthy pair. I think you had horseshoes up some dark portion of your back parts.